A flyweight post at a reasonable price. The newest EC70 Zero seatpost features the weight saving carbon construction of Easton's top EC90 model, with an alloy upper clamp plate to bring the price down. The EC70 CNT™ composite uses Carbon Nanotubes for an incredible strength to weight ratio. Relief-Area Design™ features a flat section corresponding with the clamp zone to prevent crimping. Butted Taperwall™ tubing removes excess material for even greater weight savings without sacrificing strength. 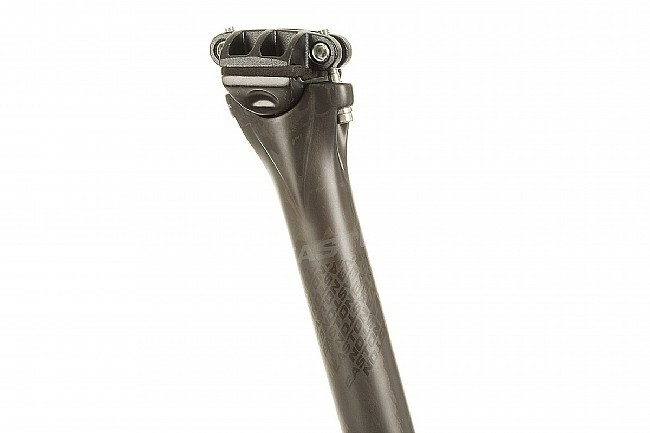 The EC70 Zero Seatpost is available in 27.2, 30.9, and 31.6mm diameters. 400mm length. No offset. Matte UD Carbon. Claimed weight: 240g (31.6 x 400mm). This is nicer than the Fisik that I have with the single bolt.